London is a huge city that is constantly expanding, and as such there is always some type of construction going on somewhere. It may be renovations of an old flat, building of a new apartment block or business complex. Building is usually a messy process when it comes to waste accumulation. There are different types of waste that will be lying around during and after a construction or renovation project. The kind of waste that a construction process leaves behind is not only difficult to handle, but also risky if carelessly left lying around. If this waste is disposed wrongly without following the due process, it can cause a great deal of environmental pollution or physical harm. If you would like to clear any wastes in London, Just give a call to Quick Wasters Rubbish Removal Services In London. What is the common waste that can be found at a construction site? Dealing with this kind of waste needs expertise and experience. The builders may lack the kind of professional know how to thoroughly and safely clear a site. 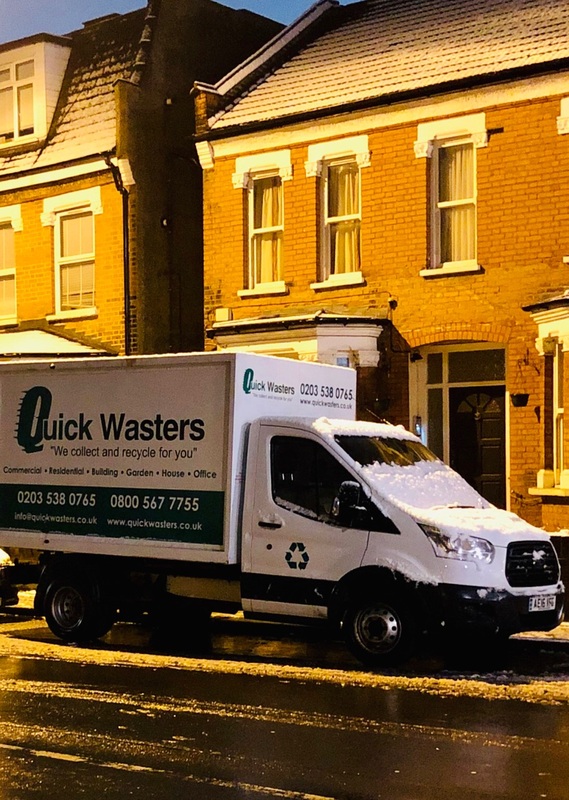 This is where Quick Wasters rubbish Removal Company comes in; our highly qualified crews will ensure that the waste in your newly finished building project is safely and thoroughly removed. How will Quick Wasters waste removal company clear your site safely? Protective gear; pieces of glass, broken pieces of tiles and paint cans, isn’t this the kind of waste that can inflict injury if recklessly handled? Don’t worry our qualified team will show up at your site armed with the right safety gear to collect the waste. This gear will range from gloves to steel capped boots, your staff will not need to take unnecessary risks clearing your site. Safe disposal; waste from construction site does not only pause physical harm, It can also be environmentally hazardous. Are you concerned about how the waste collected from your site will be disposed? No need, we’ve got you covered. Our staff are trained on the environmental risks that wrong disposal methods of different waste could cause. We are keen on good practice to make sure the waste we collect does not end up somewhere polluting the soil or water. We are aware of the irritants and toxic chemicals that some of the building materials might have. Plastics wastedoes not decompose and can end up in all the wrong places if not disposed properly, that’s why are eco-friendly to ensure this does not happen. Fully licensed; compliance to the policies set by the authorities is key to every business. Failure to comply can lead to problems with the law which can greatly inconvenience service delivery to the customer. With Quick Wasters you do not have to worry about this issue because we are fully licensed to operate. Once we start working at your premises you are assured that no compliance issues will interfere with the process. Insurance; there are different risks involved with different types of work. Insurance minimizes these unforeseeable risks. Sometimes minor accidents or damages may occur depending on the nature of the work. This occurrences can cause an inconvenience in the waste removal clearance process. We are insured and covered from any unforeseen risks to ensure that you as our client will enjoy the full benefits of our service without problems. Trained personnel; working in any building site requires well trained personnel who have been fully trained on the risks involved. The rubble and debris from a construction site requires to be handled with care to protect oneself and others from physical injury. The removal tools and equipment need to be operated by well-trained personnel. Our team is highly trained and works with great care and coordination to minimize risk and deliver without a hitch. We are accredited and approved by the Environmental Agency to offer construction waste removal services at your site. The sensitive safety issues are our top priority, your satisfaction matters for us. Feel free to entrust with waste removal from your building site. Quick Wasters has the capacity to handle your waste clearance needs professionally at your site regardless of the amount present. It may be a newly renovated residential house or a huge newly built warehouse; contact us for the best and safest building waste clearance services in London and surrounding areas.